Three young confidence tricksters— Vinnie, Carter and Rosie — pull off a racing scam, substituting winners for plodders and winning big money on long odds. When an official uncovers the scam, they set him up for blackmail. 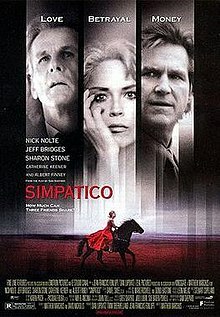 Twenty years later, Carter and Rosie are married, successful racers in Kentucky about to sell their prize stallion, Simpatico. Vinnie, meanwhile, is a drunk in Pomona. Vinnie decides to make a play for Rosie, lures Carter to California, steals his wallet and heads for Kentucky with the original blackmail material. Carter begs Vinnie's friend, a grocery clerk named Cecilia, to follow Vinnie and recover the material that he has in a box. The film received negative reviews from critics. It currently[when?] holds a 25% rating on Rotten Tomatoes based on 61 reviews.